5 new Round Table Pizza Coupons. 15% off, Specialty pizza discounts, and more.. Not valid with any other offers. One Coupon Per Order. Valid at participating locations. Some coupons are valid only when calling in orders. 15% off Orders with Code: save15p or 15pc or web15 Valid at participating locations. Not valid with any other offers. Delivery charges may apply. Some locations only take coupons by phone. 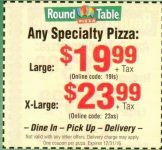 These coupons and deals for Round Table have expired but may still work. 20% off your Online Order only on regular priced items. Coupon Code: GAME20 May only work by phone. Valid at participating locations. Additional delivery fee may apply. Not valid with any other offer or discount. 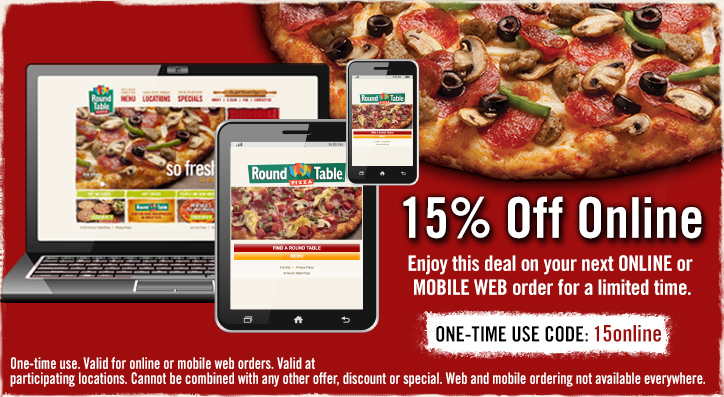 6 new Round Table Pizza Coupons including: 15% off Online orders 1/2 Price 2nd Pizza Not valid with any other offers. One Coupon Per Order. Valid at participating locations. Some coupons are valid only when calling in orders. Free personal pan pizza from 2 to 5 pm when you buy any Pepsi product. Valid 2/9/2018 only. At participating locations. Any 1 Topping Pizza: Medium: $13.99+tax - Online Code: 131m Large: $16.99+tax - Online Code: 161t X-Large: $19.99+tax - Online Code: 181x May only work by phone. Valid at participating locations. Additional delivery fee may apply. Not valid with any other offer or discount. Any Specialty Pizza: Large $19.99+tax - Online Code: 19ls X-Large $23.99+tax - Online Code: 23xs Not valid with any other offers. Delivery Charge May Apply. One Coupon Per Order. Valid at participating locations. 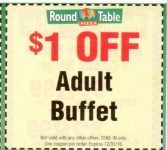 $1 off Adult Buffet. Not valid with any other offers. DINE-IN only. One Coupon Per Order. Valid at participating locations. 20% off your Online Order on regular priced items. Coupon Code: 20online May only work by phone. Valid at participating locations. Additional delivery fee may apply. Not valid with any other offer or discount. $4 off any X-Large Pizza online code: 4xl $3 off large online code: 3lg $2 off Medium Pizza online code: 2md May only work by phone. Valid at participating locations. Additional delivery fee may apply. Not valid with any other offer or discount. $0 delivery fee on your order from Italian Tonight? Collection Code: pastaparty Customers with multiple Postmates accounts may be excluded from this promotion. Maximum offer value up to $20. Round Table Pizza is a large chain of pizza parlors in the western United States.